First of all, kindly forgive us for using this happy, devotee-family day of gathering to worship lord Jagannatha's Ratha-Yatra festival, as a venue for presenting this unpleasant news, but after much soul-searching, we remain firmly convinced that the tremendous injustices and hypocritical activities being perpetrated within Srila Prabhupada's society - under the banner of 'increasing-the-preaching', be placed before the society-at-large for your due considration. LET THE TRUTH BE HEARD! We are Krsna das and Satchitananda das - initiated into Srila Prabhupada's society by Kirtanananda Swami many years ago. We represent the Interfaith League of Devotees, a group formed some 21 years ago, and are responsible for the construction and financing of the six-story Sanctuary building at 25 1st Avenue, New York. Many of you have come to dine at our Restaurant during previous Rathayatras. Unfortunately, we are unable to serve you in that capacity this year because our restaurant, along with the entire building, is currently embroiled in extensive court proceedings as we fight to subdue Yajna Purusha's bogus attempt to duplicitously hijack the entire property for his own selfish ends. It is with a heavy heart indeed that we are presenting this to you today; a sad tale of so-called brahmacharies and renunciates in their mad dash to rapidly climb the Hare Krsna corporate ladder, abandoning the idealism, simplicity, and straight-forwardness that their ashram calls for. As a result of a tremendous collective effort and self-sacrifice by several of Kirtanananda Swami's disciples, over a period of 12 years, the Sanctuary was purchased and transformed into a beautiful temple - meant to serve as home and headquarters for Kirtanananda Swami once he came out of prison. Yajna Purusha and his brahmacharies moved into the Sanctuary as rent paying tenants, aided by Sukavaha (Eternal Love), a prominent member of Sanctuary. Again aided by Sukavaha (Eternal Love), Yajna proceeded to surreptitiously get himself positioned within the existing management structure as president, then attempting to kick out all those devotees who had sacrificed to build the Sanctuary, lived in the building except his own men. It was a most unabashedly lust-for-power move, especially considering that he is already president and in-charge of 26, 2nd Ave., having acquired a majority of voting rights in that project by questionable means. 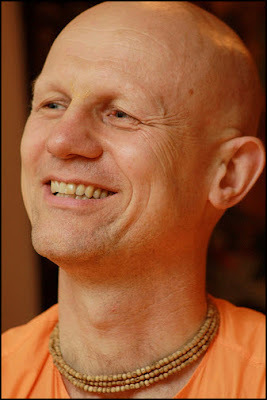 When asked why he is so determined to fully take over the Sanctuary project by any means necessary, Yajna's response was that, seeing as how there is no program for maintenance of devotees in ISKCON once they become old, as the independent, managing/financial director of the League of Devotees, he would be set for life. This clearly shows the true motive of Yajna Purusha. Here let us quote Srila Bhaktisiddhanta Saraswati Thakur Prabhupada..." Deceitful and hypocritical persons may exhibit a high standard of external behavior. Motivated by the fulfillment of their own selfish desires, they wear the dress of saintly persons like actors on a stage. Such persons are jealous of others and always planning evil works...". As the court battle began to determine who are actually the legitimate League of Devotees Board of Directors, we approached Yajna outside the courtroom and asked him - "Why are you doing this - going back on your word, misrepresenting the truth, connivingly playing such power politics; a DEVOTEE would never act like this!" His reply..." I am not a devotee...". Many of you attending today's festivities can relate to the various issues being discussed herein...(A) the tragic consequences of misplaced faith in less-than-transparent 'spiritual' leadership, (B) institutionalized power-politics regarding 'spoils-of-war', i.e., temples, properties, monies, voting rights, etc., which can only be acquired after (C) totally and unequivocally decimating the opposition (one's own god-brothers!) in hopes of gaining full freedom to 'preach' love-of-Godhead, once the irreverent bhaktas have been fully checked in their efforts to worship Krsna. And so the court battle continues. Today, we are calling on all sincere devotees to stand with us in our struggle to expose this gross materialism parading in the dress of brahminical culture, which is devastating Srila Prabhupada's movement and ruining the lives of so many individuals who gave their life's blood for this mission, only to find themselves cheated and broken-hearted by such unscrupulous 'brahmanas'. Sri-Sri Radha Murlidhara are the presiding Deities of the Sanctuary, and ultimately we understand that They will decide who will remain as Their servitors. Thank you for your kind attention.